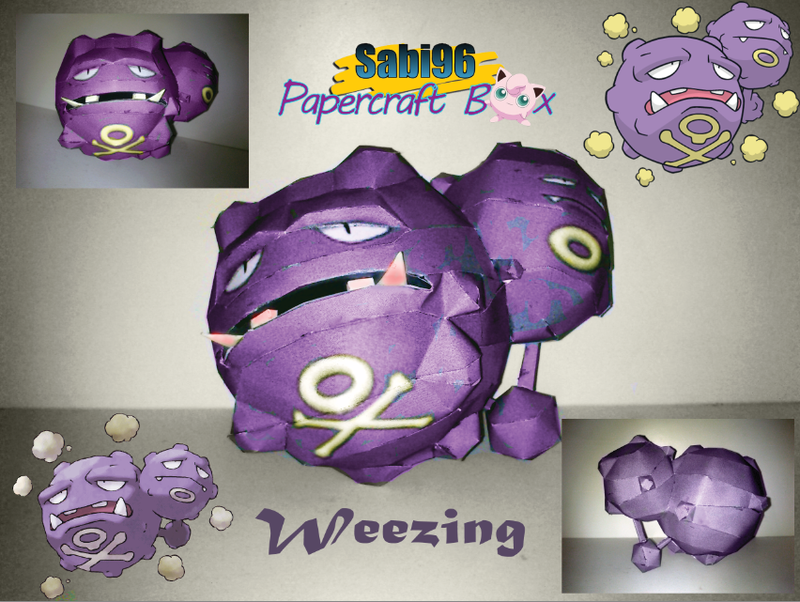 Weezing mostly look like two Koffing stuck together, albeit both being a lighter shade of purple than an actual Koffing, with one being larger than the other is. The larger head sports the skull-and-crossbones design featured on its pre-evolution, while the smaller head only has a light yellow circle underneath the face. It also has a third chamber on its underside, presumably for storing extra toxins, which resembles a tiny version of a Weezing head, minus the face and skull-and-crossbones pattern. Two small appendages connect this extra chamber to the heads. The larger head has prominent eyebrows, pointed teeth protruding from its lower jaw, and flatter teeth on its upper jaw, while the smaller head simply has two pointed teeth, one at each corner of the mouth. Triplet Weezing have been discovered, although they are extremely rare. It evolves from Koffing starting at level 35.